For kids and kids at heart, building something in the sand just may be the ultimate beach activity. Theres simply something special about using sand, water, hands, and a few tools to sculpt a scene right out of a fairy tale. If you like elaborate versions of these coastal creations, the religious tableaux sculpted by Randy Hofman every summer alongside the Boardwalk in Ocean City, Maryland, are beyond compare. For a simpler approach, the first-time creations of children in Lynn McKeown's free sandcastle-building classes every August on Delaware's shore can't be missed. Its hard to overlook Randy Hofmans sandy handiwork. From spring to fall each year, the trained artist and ordained minister builds huge sculptures on the beach in front of the Plim Plaza Hotel in Ocean City. Randy has worked in the sand since the mid-1970s, and his creations lure hundreds of tourists and locals to the boardwalk. "I grew up near Washington, D.C., and our family would come to Ocean City for vacations," Randy explains. "I was one of nine children, and we would all run down here and play in the sand." From those simple beginnings, the size and scope of his work has grown over the years, with the finished scenes now often reaching forty feet in length and ten feet in depth. I try to do something unique each year, says Randy, who adds lighting to illuminate his sculptures at night. He also includes scripture verses in some scenes, which typically take about 6 to 18 hours to complete. With lots of helpers hauling sand, he creates sculptures inspired by art from religious books and his own sketches. Randy's creations have become a big-time tourist draw in Ocean City, with USA Today naming them as a Must-See seaside attraction. Ocean City is a family destination so I feel Im somewhat of an emissary, he says. The crowds gathering around his sculptures each day (and night) certainly attest to that. Every August morning finds groups of parents and children sitting patiently on the beach near Lewes, Delaware, awaiting the arrival of the Sandcastle Lady. The kids jump up to meet Lynn McKeown as she makes her way across the sand, carrying a worn beach blanket and an array of buckets and pails. The Pennsylvania resident has spent her summer vactions in Lewes for more than 40 years, devoting much of that time to helping hundreds of kids build castles--and memories--in the sand. 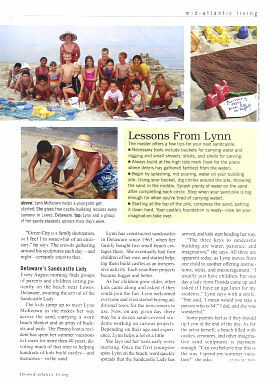 Lynn has constructed sandcastles in Deleware since 1963, when her family bought two small cottages there. She eventually had four children of her own and started helping them build sandcastles as an inexpensive activity. Each year their projects became bigger and better. As her children grew older, other kids came along and asked if they could join in the fun. Lynn welcomed everyone and even started buying additional tools for the newcomers to use. Now, on any given day, there may be a dozen sand-covered students working on various projects. Depending on their age and experience, Lynn helps a lot or a little. She lays out her tools early every morning. Once the first youngster spots Lynn on the beach, word quickly spreads that the Sandcastle Lady has arrived, and kids start heading her way. The three keys to sandcastle building are water, patience, and imagination, she says. All three are apparent today, as Lynn moves from one child to another offering instruction, ideas, and encouragement. "I usually just have children, but one day a lady from Florida came up and asked if I have an age limit for my sudents," Lynn says with a smile. She said, 'I mean would you take a person who is 84?' I did, and she was wonderful." Some parents feel as if they should tip Lynn at the end of the day. As for the artist herself, a beach filled with castles, creatures, and other imaginative sand sculptures is payment enough. "Can you believe this is the way I spend my summer vacation? she asks. You can reach Randy through his Web site, www.randyhofman.com, and Lynn through hers, www.geocities.com/sandcastlelady.